My sister sent me a thoughtful message about my mom and death a couple of weeks ago, but even before she sent me the message, my thoughts were already dwelling on my mother’s passing. Why? Because of Facebook’s app, “On this Day”. I woke up on a Saturday morning, and it showed me the highlighted post for that day, six years ago, that hit me like a gut punch. The following days’ statuses, as brought to me by Facebook, were no better. Rachael Wolfgang is in a good place. Treatment seems to already be having an effect. Hopefully there will be less hospitals shortly! Chemo finished (pending appointment on Thursday to see how it’s working). Rachael Wolfgang is exhausted and feels emotional. Second round started today. Mom’s t-cell count is poor. She’s losing her hair, and her veins have hardened due to chemo. After 6 hours, the IV therapy team was able to place a picc line, verify it was in correctly, and the premeds finally started at 7:30pm. She’s staying overnight. Two more days of this round to go. But I have an awesome hubby! That first post that came up was so innocent, but it was the first time I’d seen this reminder of what was going to be the worst time of my life. And it brought everything I had squashed so neatly into the recesses of my faded memory back out into the open. It brought back the memory of my estrangement from my mother on account of her untreated schizophrenia. At least, that’s what I believe the diagnosis was, based solely on her asking me when I was 11-years-old if I thought she was schizophrenic, because her psychologist had told her she was. The rekindling that happened after her complete break in 2003 was slow. It happened over years of stopping by my childhood home and not knowing if she would open the door and look at me like a stranger, if she would talk to me as if she vaguely recognized the demon-spawn wearing the skin of her daughter, or if she would simply rant while cleaning the meager possessions she held onto before rushing me out of the door as if I was about to attack her. I dropped grocery bags on her step when she wouldn’t answer, and I didn’t know if she would eat the food in them, or if they would wind up in the trash bin, untouched, because clearly this demon-spawn was trying to poison her. Slowly, slowly, with each cheerful smile from me, the visits of my other siblings, and my dogged insistence on offering hugs at each meeting that she slowly began to accept, she came back to me, back to us, in bits and pieces. That little smile came out. I listened to her talk about the squirrels, and the neighborhood cats. It wasn’t just me – my siblings were there with me when we would coax her to come with us to Mother’s day events and birthday events. She wouldn’t consent to going to our friends’ or in-laws’ Thanksgivings, but we learned that there were restaurants that remained open on Thanksgiving, so she began to consent to Thanksgiving lunches. Finally, now that we were all a little older and understood a little more how horribly isolating and terrifying living with a mental illness could be, with patience and love we were drawing her out of her shell. So, with these innocent little words, it all flashed back. The worst time of my life, on repeat, as I lost my mom for what would be the last time. I didn’t realize that almost six months after writing these little status updates, I would be holding my mom’s hand for the last time, caressing her hair out of her face (as she had done so often for me when I was a child), and kissing her cold forehead. No one tells you or prepares you for that, by the way. How quickly your loved one cools to the touch. It happens as their organs fail, even before that last choking breath. The breath that catches in their throat, and you hope you’re wrong, that there will be another one, that their chest will rise and fall one more time, but it doesn’t. And when you realize it’s the last one, you crawl next to what’s left of your mother, hold your little sister’s hand across her body, and in silence, weep together for the gaping loss of the one person who stood like a wall of MOM she was against everyone who ever tried to hurt you. With that little reminder from “On this Day”, all the memories of my mom’s desperation and anger, her mounting fear of the nurses as each attempt to insert the IV failed, my talking with the nurse and doctor, as they asked if, in light of my mother’s mounting paranoia and verbal abuse of the staff, if they could administer anti-anxiety medication. I knew what she would say, as she had told it to me all before when I made the futile threat that if she didn’t agree to take medication, I couldn’t continue a relationship with her. So I told them she wouldn’t consent, and they asked if I had POA, which I did, and asked if I would consent on her behalf. I did. She had granted POA to me months before she realized it was cancer that was making her hurt so much. Her increasing frailty coupled with my siblings and I talking her into seeing the doctor meant that she would only go if she could afford it, and she wouldn’t fill out the paperwork, because she was afraid of what all the little sentences and legal clauses meant. I couldn’t fill out the forms properly without looking at her finances, so one thing led to another, and I was her trustee for her social security and disability, and held POA for her, all of which she gave to me with profound relief. She finally signed the papers we had hoped for all those years ago when we were trying to get her to treat her mental illness. Why? Paperwork. So I could take the burden of paperwork from her. I don’t say that lightly or in jest. I’ve heard people make fun of the indigent who don’t seek the proper, free care that’s available to them because they don’t realize the sheer panic that sets in when a mentally ill person is asked to fill out papers-upon-papers detailing the past few months of their lives, when they have no idea where they were that morning, and keep no papers because they are afraid each piece of paper that comes to them in the mail is poison. That post from September 9th, brought me back to my mother’s hospital room where her chemotherapy was being delivered. Me, in my work clothes and long jacket, because we had thought it would be just a few hours, like the previous treatments. The whispered discussions outside her room as I fought back tears and authorized the doctor and nurses to give my mother anti-anxiety medicine, and went in and lied to my mother’s face that the medicine they were about to give her would help them insert the line. It wasn’t really a lie, because it *would* help them, but it still felt like a lie. You know what felt like the worst part of this whole thing? The only reason mom was doing chemo at all was because of me. Me and my siblings, but, as usual, memories tend to be pretty “me”-centric, so I remember a lot of begging and cajoling, and finally, the vague assent. 17%. That’s what it meant. I could tell from the look in her oncologist’s eyes that the number was probably much lower in my mother’s case. Especially once she said that under no circumstances would she consent to a hysterectomy. That number plummeted. I don’t remember to what – I really don’t. I know the oncologist told me, but I think I blocked it out. I had to believe that the mother who was with me in that room, holding my hand and squeezing it reassuringly, I had to hope that I could have her a little longer. So, the paperwork. That was finally the straw that did it. Had I realized all those years ago, I would have offered sooner to be the paperwork mule. “Mom, give me power of attorney, and I will read all your mail. Name me your trustee, and I will cash your checks, give you a stipend, pay your taxes, pay your mortgage, call the insurance guys and yell at them when they charged you too much…” It only took a few hours a week, and I did most of it on my lunch breaks, stopping by her house on the way home a few times a week to pick up bills (before she had the opportunity to open them and cut or scratch away the addresses and account numbers that would let me pay them). Maybe I would have had more of my real mom, the one who could still smile and laugh, before the other mom reappeared. For those glimpses of the mom-who-used-to-be, I would have done anything. Even if the following months tore me down, and the reality of being the life-line for a person who would leave a voicemail that was simply, “Hi, honey, just checking in on you. You seemed stressed the last time we talked” one moment, and call ten minutes later and leave another message yelling at you and accusing you of trying to kill her. The thought that kept me going, when I wanted to quit and questioned if the hurt and pain of every scathing accusation was worth it was simply this: if I stopped, if I gave in to the despair, the verbal torment of the not-mom-but-looks-like-her, she would, too. And, would I ever be able to forgive myself? I knew the answer to that question, so, I would take a deep breath, pick up the phone at the end of the work day, and call her and pretend like I’d only gotten that first message. I would tell her I loved her, that I was stopping by after work, and ask if she needed me to pick up anything on the way. If one of my siblings said they were stopping by, I would breathe a sigh of relief. The “On this Day” reminders initially made me sick to my stomach. I wasn’t quite sure how I felt to have my words, and all the raw memory, just thrown in my face. All the nuances of the love, the hate, the guilt, the forgiveness, the roller coaster of slow-but-fast dying of cancer, and all the “would-haves” and “could-haves” that come with watching a loved one die… They were reminders of the worst time of my life. But they were also reminders of just how strong I was then and of how lucky I was to see so many glimpses of the mom-who-used-to-be. Even through the mental illness, when she saw my shock and hurt at her diagnoses, she squeezed my hand. When something was hurting me, that mom-who-used-to-be came surging back. They also showed me, through the comments on each status, that I wasn’t alone. My husband, siblings, family, and friends were a bedrock of love that carried me through. They gave me something that helped me endure: the image of me as they saw me: strong, humble, capable, compassionate, and giving. That was my life-line, because without their support, I felt like I was flailing in the dark. Sorry for the long preamble. This post was actually just meant to say, at the suggestions of my older sister, who has recently, written a series of posts on this matter, that I will over the next few weeks be posting my ramblings from this period, back-dated to the date of writing. See my sister’s moving blog entry that inspired this, Losing Loved Ones Still Here. See also my littlest sister’s blog for her own perspectives of losing our mom, my dear Octopus Lady. We lost many of our childhood pictures, but I am so thankful for this one, that shows my mom as I remember her. 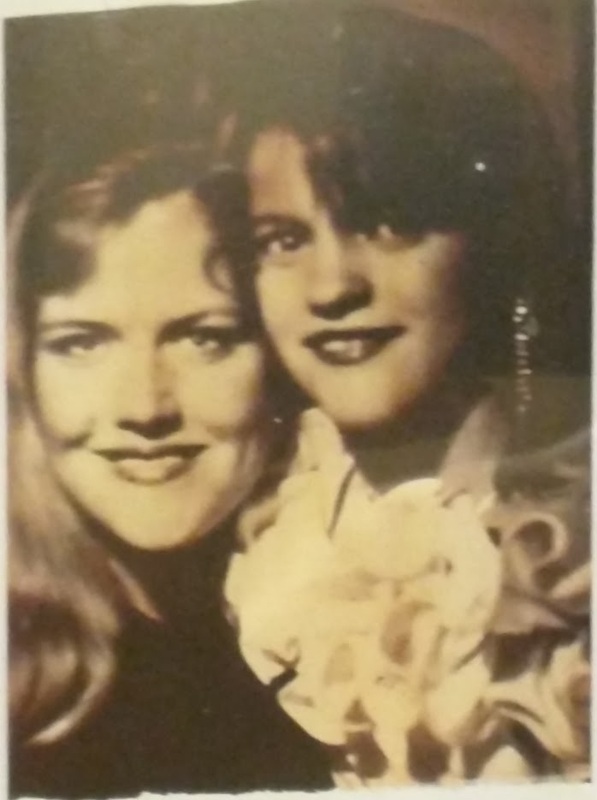 Mom and me, circa 1991. Mere weeks after this picture, my mom told me she had been diagnosed as paranoid schizophrenic. Thank you so much, Deb, and what a beautiful post. I feel so incredibly lucky to have the sisters I do!